The entertaining Abbey House Museum is contained in the gatehouse of the picturesque, ruined Kirkstall Abbey, dating from 1152. 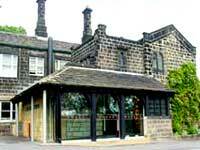 Abbey House allows visitors to walk around the streets of 1880s Leeds, while the upstairs section features galleries detailing the history of Kirkstall Abbey and the social history of the area. The museum has won awards for being family-friendly and fun for children. There is a restaurant and a gift shop at the museum. What is left of Kirkstall Abbey is set in lovely grounds by the Aire River and it would be a great pity to visit the museum without exploring the ruins. There is a small playground for children outside the museum.